The varied nature of the liquid waste in sump pits can create difficulties with accurate level measurement. WIKA’s submersible transmitter avoids these problems by measuring the hydrostatic pressure of the liquid in the sump pit. 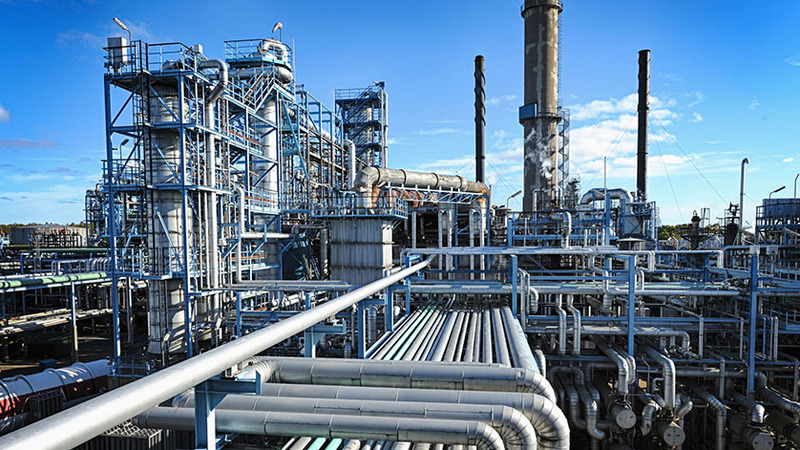 Power plants and refineries, along with chemical and paper manufacturing facilities, all generate large quantities of liquid waste during their operations. This hazardous material is stored in sump pits before it is treated and then recycled or released back into the environment. In addition, both power generation and process plants typically remove excess heat using evaporative cooling towers, which have a dedicated sump. Typically gravity-fed pits or tanks, sumps usually contain water, various chemicals, grease, oil, and/or a broad range of particulate waste of varying size. This liquid waste is constantly monitored; when it reaches a predetermined level, pumps automatically move the industrial sewage into a bulk storage area in preparation for treatment. Industrial sump pits are difficult environments to monitor. Common level measurement devices are not suitable for this viscous, particle-rich, and highly variable environment. What’s more, the devices require frequent maintenance or replacement in this harsh medium. Temperature is another consideration, as liquid waste added to sump pits is often hot, which can cause measurement inaccuracies related to rapid temperature changes. In the past, various industries have used mechanical floats, bubblers, and several types of probes for sump liquid level monitoring. However, none of these solutions are ideal due to problems related to scum buildup and plugging mixing particles. Some sump liquids also contain detergents that can produce froth and foam, straining pumps, blocking outlets, and making measurement difficult.Because of their low cost, float balls and bubblers are the devices most commonly used to monitor sump pit levels in power plants. These measurement systems, though, require regular cleaning to keep them operating, and typically have short lifetimes. WIKA’s submersible liquid level transmitters measure the hydrostatic pressure of a liquid to monitor the fill level of tanks, reservoirs, and sump pits. The level measurement data is sent by the transmitter as an electric signal that changes linearly and proportionally relative to the current hydrostatic pressure directly above the sensor. The particulate matter in the sump liquid does not affect hydrostatic pressure measurement using submersible pressure transmitters. Furthermore, WIKA offers temperature-compensated sensors designed for use at high or low temperature ranges. WIKA produces several models of robust, reliable, and economical submersible pressure transmitters. The standard model LS-10 offers 0.25% BSFL accuracy. The IL-10 is an intrinsically safe submersible level transmitter for hazardous operations that meets or exceeds IECEx, ATEX, FM (U.S.), and CSA (Canada) explosion protection standards. The high-performance model LH-10 offers 0.125% BSFL accuracy for demanding applications. Model LH-20 has been designed for the most demanding submerged level measurements. With 0.1% accuracy and a slender design, it is suitable for almost all applications and liquid media. When you buy a submersible pressure transmitter from WIKA, you are buying a complete measurement solution designed for your specific application. The LS-10, Il-10, LH-10, and LH-20 meet all standards for permanent submersion and include a tether cable of varying length that supports up to 220 lbs. of strain. Adding extra weight helps stabilize submersible pressure transmitters in turbulent media. The additional weight also simplifies lowering the device through grates, narrow shafts, and deep wells, and helps reduce any potential negative influence of the measuring medium (e.g., turbulent flows). Cable strain relief clamp: The cable strain relief clamp permits secure mechanical fastening of the submersible transmitter’s cable at the measuring point. The relief clamp also minimizes tensile stresses and assists in guiding the cable to prevent mechanical damage. Cable box: The cable socket is designed with IP 67 ingress protection and a watertight ventilation element, guaranteeing moisture-free electrical connection for the transmitter. LevelGuard anti-clog system: WIKA provides LevelGuard, an innovative and highly effective particle-filtering accessory, as a standard offering with level measurement solutions. Contact WIKA’s expert technical support staff for more information about pressure transmitters and accessories.